Warning: These are not so good for you, but they are so yummy. Sometimes we just need to indulge a little (or sometimes a lot!) … If you love the peanut butter – chocolate combination, then these will hit the spot! The cupcakes turn out so so moist and surprisingly they’re not too overwhelmingly sweet. There’s a nice balance between the chocolate and the peanut butter! This recipe is definitely on my top 10 favorite things to bake list! 1. In a large bowl, combine the cake mix, water, peanut butter, oil, and eggs, beat on low speed for 30 seconds. Beat on medium for 2 min or until smooth. 2. Fill paper-lined muffin cups 1/2 way. 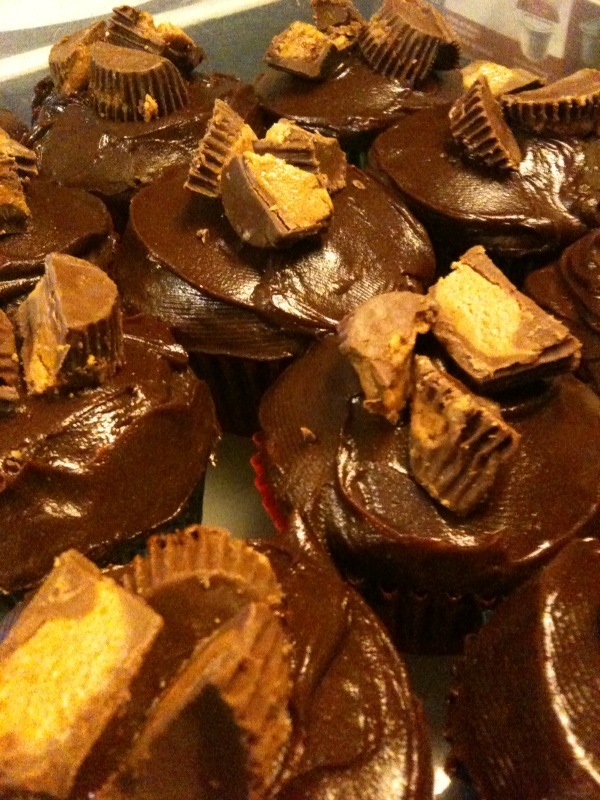 Place a peanut butter cup in the center of each cupcake. Cover each with 1 tablespoonful batter. 3. Bake at 350 degrees for 18-22 minutes or until toothpick is inserted near the center corners out clean. Cool for 10 minutes before remove from pan to wire racks to cool completely. 4. Place chopped chocolate in a small bowl. In a small saucepan ring cream just to a boil. Pour cream over chocolate; whisk until smooth. Stir in peanut butter. Cool, stirring occasionally, to room temperature or until ganache reaches a spreading consistency, about 10 minutes. 5. Spread over cupcakes, immediately sprinkle with additional peanut butter cups. Let stand, until set! I love your blog! And your cupcakes are delish! Rach! Thank you so much!! 🙂 I will bring in something yummy again soon!